You have some free time ahead and you would like to help with the digitization of the Marie-Victorin herbarium (Herbarium of the University of Montréal) ? The herbarium is working with the crowdsourcing platform Les Herbonautes, developed by the National History Museum of Paris, in order to digitize nearly 7000 specimens of its collection. These specimens will then be added to the ones already published on Canadensys and GBIF by the Marie-Victorin herbarium. If you wish to participate to this mission, go HERE, click on ‘Contribute’, and start to fill the data. It is as simple as that! What is a crowdsourcing platform ? Crowdsourcing platforms are used to involve people around the development and advancement of a project, relying on the expertise and time of a large audience rather than just few people. In the last years, several platforms have been developed and used in the large digitalization effort of natural history and art collections, relying on the interest of visitors and volunteers passionate about biology, science and art. 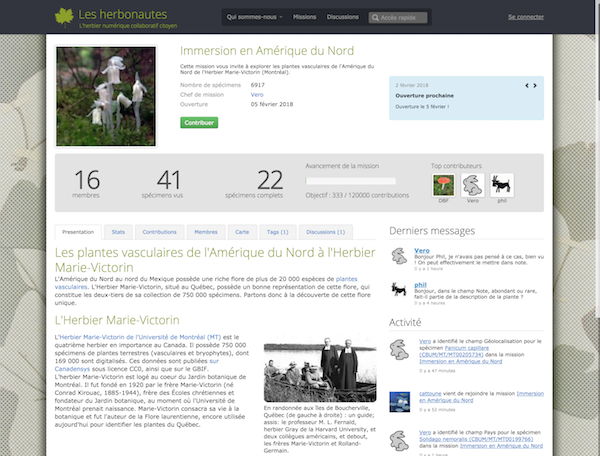 In addition with Les Herbonautes, the most active platforms are Notes from Nature, Digivol, and the Smithsonian transcription platform. If you are a student, retired, in vacation, passionate about botany, or if you need a break during your day and you want to participate to this digitalization effort, don’t hesitate to join the mission and start filling the data. Even if it’s just for one or a few specimens, it is already wonderfully helpful, and we give you our thanks for your time and your implication !